THE FOUR-DIMENSIONAL NIGHTMARE – J.G. Ballard (1963) | Weighing a pig doesn't fatten it. The collection opens with The Voices of Time (1960, 35pp). It’s a great story that ticks a lot of boxes: a possibly unreliable narrator, a dying world, a bleak setting that casts doubt on the usefulness of space exploration and first contact. Ballard is sparse with his information, and gradually we get a grip on what is happening to the inhabitants of a future Earth. The protagonist may be a bit pulpy at the onset of the story – a “neuro-surgeon extraordinary” – the atmosphere Ballard creates is anything but. There’s an air of “monstrous surrealism” in a hard SF jacket. A great, great opener. Next up is The Sound-Sweep (1960, 40pp). Its speculative premise – sounds leave traces in rooms that can still influence people subconsciously – is rather unbelievable, and the story hinges on a protagonist with a unique talent – he can hear these traces, often even verbatim conversations, days after they’ve happened. Because of that, the story is maybe the most dated of the collection. I didn’t really buy other stuff either: for one, I don’t see our culture switching to ultrasonic music, abandoning regular music totally. Ballard nonetheless manages to evoke a credible atmosphere, and the story is entertaining throughout. Part of that are two successful renderings of a typical Ballard character it seems: the loner populates nearly all stories in the collection. The Sound-Sweep is also one of the two meta-stories about art in this collection. A bit sad to see Ballard – or his protagonist at the very least – is still stuck in the modernist high-vs-low paradigm, opposing art to entertainment, putting art on the pedestal of Perfect. All right, Mangon, you’ve made your point. You’re carrying a torch for art, doing your duty to one of the few perfect things the world has even produced. At the same time, the artist in the story has lost her powers. In the end, all fails. The artist insane, the audience unable to appreciate anything but entertainment. Prima Belladonna (1956) is set in Vermilion Sands – more on that later – and ultimately, as a story, is rather thin. The concept is murky at best. It features choro-flora (sound plants) and a femme fatale. It’s only 15 pages, and while it might be a bit shoddy content-wise, again, the atmosphere – “boredom, lethargy and high summer” – is right on. Studio 5, The Stars (1961) has the same setting, but with its 35 pages it is a bit more elaborate. To me, this was the least successful story of the collection. It’s again meta on art, and with it Ballard displays a strange aversion to technology. I will not argue such aversion is strange for a science fiction writer, because it needn’t be, especially not for writers with an inclination to the dystopian, as Ballard clearly has. The story is about the fact that poets use computers (“verse transcribers”) to compose their poetry. What Ballard misses is that while such automation obviously changes the product, it doesn’t necessarily make it less artistic. The poet still needs to chose the settings, the meter, determine the content, etc. In short, technology aids, yes, alters, yes, but doesn’t completely take over artistic responsibilities. Ballard shows a Romantic conservatism I had not expected. At the same time, one of the main characters kinda admits this, but she reverses even more, into a True Inspiration mode, into Essentialism. Yet she fails to give an answer or a way out, and falls back on a myth of sacrifice. Ballard tried too much with this one. I’m not sure the short story form is adequate for art theory. Again, the atmosphere is fantastic, the prose excellent, the setting great – yet I’d rather Ballard wrote an essay on the matter, as he clearly had the need to opine on this. An essay would have forced him to be more clear, and not hide behind characters. Maybe there’s one on the subject in A User’s Guide to the Millennium, a 1996 collection of his non-fiction? If you’ve read that, don’t hesitate to comment below. But I might be too harsh here: maybe the story was just meant to be a conversation starter? In that case, I’m not convinced it’s even an conversation worth having – but then again, I overdosed on poetry theory years and years ago. The Garden of Time (1962) is 9 pages of magical realism and claustrophobic time travel. Solid as an evocation, but too short for compassion, as we hardly get to know the characters. The Cage of Sand (1962, 25pp) revolves around an hard SF idea I haven’t encountered before: colonizing Mars would make us ship a lot of mass from Earth to Mars, possibly off-setting the Earth’s orbit with a few millimeters, and that might have unintended side effects. So the people of 2050 decide to ship back Martian sand to Earth, to keep things balanced. The story is not so much about science though, but about the few remaining characters in a barren wasteland – a sanded Cape Canaveral – shielded off from the rest of Earth, as the Martian sand proved toxic. Space-flight has come to a halt, and as a stark reminder 7 damaged spaceships circle the Earth: slowly evaporating metal coffins, shining like stars. A story again about loners and failures, it’s the one in the collection that talks most openly about its characters motivations. He disliked this failure of compassion, a nagging compulsion to expose other people’s motives and strip away the insulating sheats around their naked nerve strings, particularly at his own motives for being at Cape Canaveral were so suspect. Why was he there, what failure was he trying to expiate? And why choose Cocoa Beach as his pentitential shore? For three years he had asked himself these questions so often that they had ceased to have any meaning, like a fossilized catechism or the blunted self-recrimination of a paranoiac. This is a brilliant story about “unattained ambition” – both from the protagonist as society as a whole – and about the trauma of personal loss. It’s rather heavy on symbolism (the 7 dead astronauts, the Canaveral “cage of sand” both as a mental prison and a real prison) and as such clearly constructed, yet it works perfectly: it is totally believable and doesn’t feel forced or constructed at all. The whole trash of amusement arcades and cheap bars on the beach resorts were a depressing commentary on the original space-flights, reducing them to the level of monster side-shows at a carnival. The Watch-Towers (1962, 30pp) reminded me a bit of certain stories in M. John Harrison’s latest collection, and not only because of its eerie, stunning conclusion. Its main theme is reminiscent of Kafka’s The Castle. Again a brilliant story about people trapped. The only criticism I can think of is that in a few passages Ballard spoon feeds the reader on self-imposed moral boundaries, while the religion metaphor was already clear without him doing so. A mild annoyance only, and it would be wrong to reduce the story to such a reading only. Chronopolis (1960, 25pp) ends The Four-Dimensional Nightmare, and is the collection’s most overtly critical story. Partly set in a real prison this time, it’s protagonist is both physically as mentally trapped. Ballard paints a dystopia where people were trapped by a system that reduces them to cogs in a machine. Chronopolis is a warning about population explosion and boundless capitalism. E.P. Thompson’s seminal Time, Work-Discipline and Industrial Capitalism was only published in 1967, and Ballard’s story shows Thompson’s ideas did not originate in a vacuum. Coincidentally I came across a fantastic article in The Guardian while I was reading Chronopolis. It’s called How the chicken nugget became the true symbol of our era and it combines a lot of different fields. This passage is extremely relevant for Chronopolis. It’s only fitting that the revolutionaries in Chronopolis ban watches and clocks. Ballard shows he’s ahead of the intellectual curve. Another great story, and a fitting conclusion to The Four-Dimensional Nightmare, time being the 4th dimension. Ballard is one of the few writers whose name has become an adjective. Not that ‘Ballardian’ is used that much in regular speech, but still, it says something. 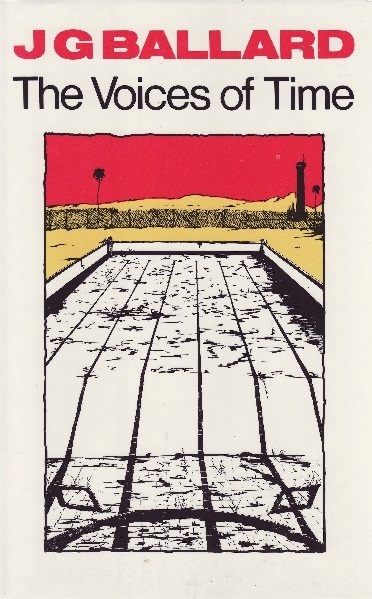 The Collins English Dictionary defines the word as “resembling or suggestive of the conditions described in J. G. Ballard’s novels and stories, especially dystopian modernity, bleak man-made landscapes and the psychological effects of technological, social or environmental developments”. That seems to be 100% on the money. If it was not clear from the above: this collection is recommended. I’ll be reading more of J.G. Ballard. In 1974 a revised edition appeared, with Prima Belladonna and Studio 5, The Stars replaced by The Overloaded Man (1961) and Thirteen to Centaurus (1962). In 1984 that particular collection got a new name, The Voices Of Time. But it’s more confusing: there’s also an earlier short story collection called The Voices of Time and Other Stories – it first appeared in 1962. It features The Voices Of Time, The Sound-Sweep and The Overloaded Man, plus 4 other stories: Zone of Terror (1960), Manhole 69 (1957), The Waiting Grounds (1959) and Deep End (1961). Science Fiction And Other Suspect Ruminations has a review. 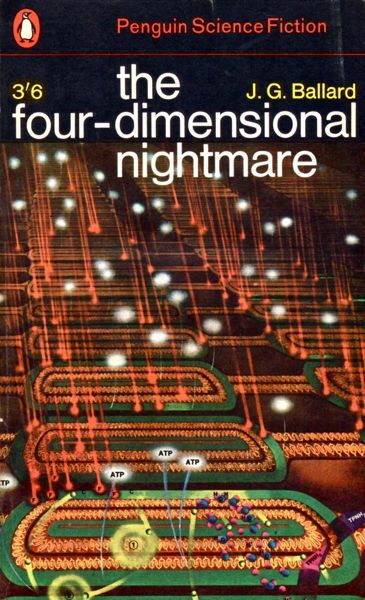 The 2 stories that were dropped from The Four-Dimensional Nightmare from the 1974 edition onward are set an artistic resort, Vermilion Sands, and together with 7 other stories in the same setting they got an own publication in 1971, titled Vermilion Sands – reprinted several times. It’s reviewed on Speculiction. Finally, Studio 5, The Stars, Chronopolis, Prima Belladona and The Garden Of Time were also featured in the very first Ballard collection, Billenium, published a year before. It has an additional 6 stories that don’t appear in the collections I’ve already mentioned. My advice would be to just get the Complete Short Stories collection published in 2001, it has 98 stories! But if your thing is vintage editions, and want to limit yourself to 1 title, you should hunt down the later edition of The Four-Dimensional Nightmare / The Voices Of Time as The Cage Of Sand, The Watch-Towers, and Chronopolis, are all excellent and are not included in the other titles I listed, and as Joachim Boaz wrote high praise for The Overloaded Man, my guess is that’s worth reading more than the 2 Vermilion Sands stories. This entry was posted in Reviews and tagged 1960s, J.G. Ballard, Review, Science Fiction, short fiction, The 4-Dimensional Nightmare, The Four-Dimensional Nightmare, The Voices Of Time. Bookmark the permalink.